Full text access is free in HTML pages; however the journal allows PDF access only to users from OMAN, developing countries and paid subscribers. allows EPub access only to users from OMAN, developing countries and paid subscribers. Liver is a vital organ that plays a major role in metabolism and excretion of xenobiotics from the body. Liver injury or liver dysfunction is a major health problem that challenges not only health care professionals but also the pharmaceutical industry and drug regulatory agencies. Liver cell injury caused by various toxic chemicals (certain anti-biotics, chemotherapeutic agents, carbon tetrachloride (CCl 4 ), thioacetamide (TAA) etc. ), excessive alcohol consumption and microbes is well-studied. The available synthetic drugs to treat liver disorders in this condition also cause further damage to the liver. Hence, herbal drugs have become increasingly popular and their use is wide spread. Herbal medicines have been used in the treatment of liver diseases for a long time. A number of herbal preparations are available in the market. The present review is aimed at compiling data on promising phytochemicals from medicinal plants that have been tested in hepatotoxicity models using modern scientific system. In the late 19 th and early 20 th century, extensive study was devoted to the use of antioxidants in important industrial processes, such as the prevention of metal corrosion, vulcanization of rubber, and polymerization of fuels in the fouling of internal combustion engines. In recent years, there is an upsurge in the areas related to newer developments in prevention of disease, especially the role of free radicals and antioxidants. So it will be pertinent to examine the possible role of 'free radicals' in disease and 'antioxidants' in its prevention. Antioxidants are intimately involved in the prevention of cellular damage-the common pathway for cancer and a variety of diseases. The reversal or suppression of premalignant lesions is an important strategy against carcinogenesis for the prevention of cancer. Whether antioxidants can protect the human population from diseases like leukoplakia, lichen planus, carcinoma in situ or oral cancer and also from cancers of the upper aero digestive tract i.e. larynx, pharynx and esophagus and increase the life expectancy is still controversial. This article deals with the action of various chemopreventive agents along with brief review of literature about the outcome of effect of antioxidant on potentially premalignant and malignant lesions of oral mucosa. Aim: Protective effects of ferulic acid (FA) against ultraviolet-B (290-320 nm) radiation induced cellular changes were investigated in human dermal fibroblasts (HDFa). Materials and Methods: HDFa cells pretreated with increasing concentrations of FA (0, 10, 20, 40 μg/ml) for 30 min, were UVB irradiated and different cellular and oxidative end points were analyzed. Results: The percentage of cytotoxicity, intracellular reactive oxygen species (ROS) levels, mitochondrial membrane potential, thiobarbituric acid reactive substances (TBARS) and DNA damage, were significantly increased in 19.8 mJ/cm 2 ultraviolet-B (UVB)-exposed HDFa. Further, exposure to UVB causes significantly decreased antioxidants status in HDFa cells. Treatment of HDFa cells with FA before 30 min of UVB-irradiation significantly restored mitochondrial membrane potential, ROS levels and antioxidant status in HDFa. 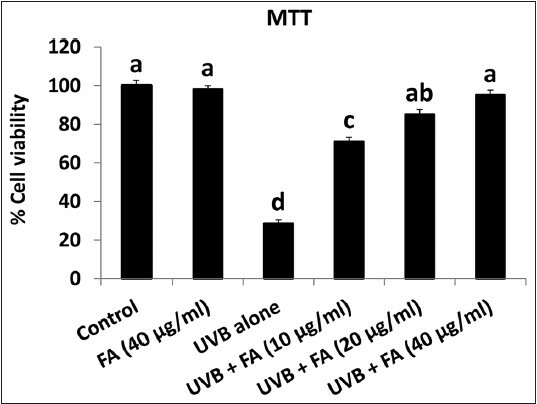 Further, FA treatment reverted UVB-induced mutagenesis in Ames tester strains and DNA damage in HDFa. Moreover, we noticed increased expression of GADD 45α, XRCC1 and HOGG1 in UVB exposed HDFa. Conversely, FA pretreatment significantly attenuated UVB-induced expression of DNA repair genes in HDFa. Conclusion: The present findings indicate that FA act as a sunscreen rather than working at molecular level to offer photoprotection. Aim of Study: The aim of the present work was to screen synthetic compound Ethyl Pyruvate (EP) for its potential use in chemotherapeutic drugs induced neuropathic pain. Materials and Methods: In vincristine induced neuropathy model, Vincristine sulfate (50 μg/kg i.p.) 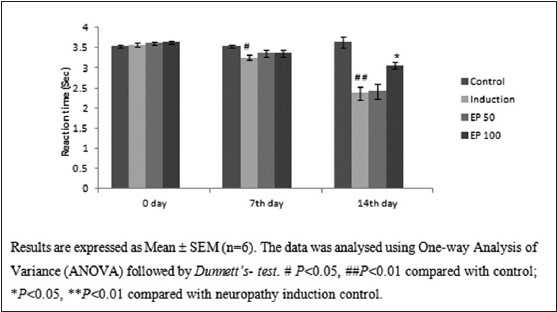 for 10 consecutive days was administered to induce neuropathy in rats with EP for 14 days. In cisplatin induced neuropathy model, cisplatin was administered at a dose of (2 mg/kg i.p.) twice a week for 5 weeks with EP for 5 weeks daily in this model. The effect of ethyl pyruvate in tail heat immersion, paw pressure and acetone drop tests were performed to assess the degree of spinal thermal sensation, mechanical hyperalgesia and cold allodynia, respectively. Vacuolar changes, necrosis and cellular infiltration of sciatic nerve were assessed histopathologically. The levels of various antioxidants were determined to assess oxidative stress. Results: In vincristine and cisplatin induced neuropathy models, co-administration of EP 100 mg/kg significantly attenuated reduction of nociceptive threshold in tail heat immersion test and threshold in paw pressure along with the increased score in the acetone drop test. EP 100 mg/kg significantly attenuated reactive changes in histopathology and increase in oxidative stress. Conclusion: The observed neuroprotective effect can be attributed to the antioxidant property of EP. Therefore, with support from the literature and data in hand it seems quite evident that EP 100 mg/kg exerted its beneﬁcial effects in vincristine and cisplatin induced peripheral neuropathic pain. Aim: The hypothesis of the current study is to evaluate the therapeutic potential of ethanolic extract from Cucumis melo L to act as an anti-inflammatory and anticancer agent on the protate gland. Materials and Methods: The study was evaluated by performing various in vitro and in vivo experiments with wistar albino rats. The statistical analysis was carried out using one-way ANOVA followed by Dunnett's multiple comparisons for the data which were normally distributed. 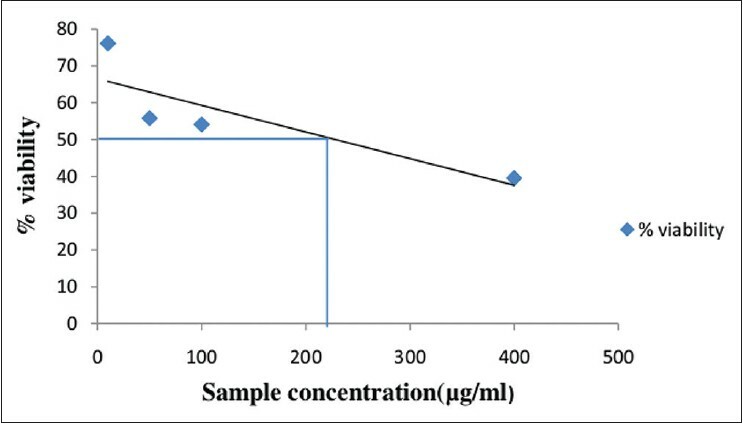 Results: The ethanolic extract of Cucumis melo L. (EECM) shows reduction in hyperplasia of the prostate which is observed by the decrease in total weight when compared to the positive control and hence is beneficial in benign prostatic hyperplasia (BPH) and also possesses apoptotic activity which is observed by acridine orange and ethidium bromide double staining and then visualized by Fluorescent microscopy. The result showed that the ethanolic extract is capable of reducing the prime inflammatory mediator TNF-α and hence reduces inflammation. Aim: To evaluate the adoptogenic activity of ethanolic extract of Mimosa pudica L. in chronic Alzheimer's model. Materials and Methods: The dried whole part of the plant were subjected to hot continuous extraction method using ethanol as solvent and were standardized using pharmacognostical and phytochemical screening. The in-vitro antioxidant studies were conducted by super oxide scavenging assay and hydrogen peroxide scavenging assay. Satisfactory IC 50 values were obtained for both assays. Dose selection for in-vivo study was made on the basis of already conducted acute toxicity studies (500 mg/kg body weight). Oral administration of extract of M. pudica was continued for 21 consecutive days. Adaptogenic activity was assessed by using oral dose of 500 mg/kg of EEMP and 2 mg/kg diazepam as test and standard compound respectively. Results: There was a significant improvement in memory, which was observed from the test paradigms viz., morris water maze, radial arm maze. Forced swim test was used as the observation paradigm for the adaptogenic activity and EEMP caused significant reduction in swimming endurance time. Conclusion: It was concluded that ethanolic extract of M. pudica at the dose of 500 mg/kg p.o produces potential changes in chronic Alzheimer's model and stress. Introduction: Intracerebral Hemorrhage (ICH) accounts for 10% of all patients presenting with acute stroke in the United Kingdom (UK).The 30-day mortality from ICH ranges from 35 to 52 per cent one-half of these deaths occur within the first two days. The significant mortality associated with ICH poses a significant challenge for the clinician, particularly with regard to decision-making around the 'appropriateness' of interventions, which may not improve or support the short-term or long-term outcomes. Aim: To examine whether the Essen Score in conjunction with dysphagia assessments could aid prognostication and decision-making, particularly with regards to artificial nutritional support and end-of-life care decision-making in patients with ICH. Materials and Methods: We retrospectively reviewed the notes of 42 patients admitted to our Stroke Unit with a primary diagnosis of spontaneous ICH, between December 2011 and June 2013. 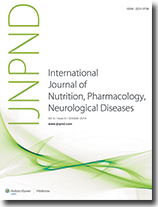 Data on survival, mortality, presence of dysphagia, and the utilization of artificial nutrition were recorded. The Essen score was applied to the same cohort of patients, with subsequent comparison of the predicted and actual outcomes. Result: Sixteen patients (38%) had an Essen score >7, with an average survival of three days. Ten patients (24%) had Essen scores <3. To date the average survival in this group is 305 days. Conclusion: We would postulate that discussions with the families of ICH patients presenting with Essen scores >7 and total dysphagia, need to focus on limiting any invasive medical treatment, including the use of artificial feeding, among cases highly unlikely to benefit from it. This highlights the potential use of the Essen score as a tool in conjunction with clinical judgment, to facilitate discussions around short-term and long-term goals set for individual patients, among the multidisciplinary team, family, and carers. Introduction: Vitamin B12 is an essential micronutrient that plays a fundamental role in cell division and in one carbon metabolism. Materials and Methods: This was an observational study carried out at among students and staff of a medical college facility located in a rural area of north-west India. Results: Mean serum vitamin B12 in both the groups of employees as well as students, was low (group I N 69: 241.56 ± 101.88 pg/ml; group II N 84: 217.98 ± 92.78 pg/ml). Using 200 pg/ml as threshold, 53.6% of total participants had low vitamin B12 concentration (66.6% of female students and 70.6% of female employees), while 16.3% of study population was severely deficient having serum vitamin B12 level below150 pg/ml. Conclusion: Our observation of high prevalence of sub-optimal vitamin B12 is consistent with findings drawn from scholarly literature and supplemented with those from our country too. Background: Linum usitatissimum Linn. (Linaceae) commonly known as linseed or flaxseed is known to be the richest plant source for alpha-linoleic acid, an omega-3 fatty acid. Aim: The objective of the present study was to evaluate the oil extracted from Linseed (LO) for anti-depressant activity in mice. Materials and Methods: Healthy male Swiss albino mice were randomly divided into five groups as follows: (i) Control, (ii) LO (4 ml/kg b.w./day), (iii) LO (8 ml/kg/day), (iv) Fish oil (FO) equivalent to 300 mg/kg/day of Docosahexaenoic acid (DHA), and (v) Standard (Imipramine). The antidepressant effect was evaluated using behavioral models like the Despair swim test (DST) and Tail suspension test (TST), and pharmacological models like potentiation of norepinephrine toxicity, 5-hydroxytryptophan potentiation, tetrabenazine antagonism, and apomorphine-induced cage climbing. Fluorimetric estimation of norepinephrine, dopamine, and 5-hydroxytryptophan levels in the brain was also carried out. Results: In case of behavioral models, LO at 0.2 ml/mice/day, significantly reduced the immobilization time. A significant antidepressant activity of LO was found in the pharmacological models. This was confirmed by the elevated levels of norepinephrine and dopamine in the brains of LO-treated animals, as compared to control animals. Conclusion: Linseed oil showed a significant antidepressant effect in various experimental models of depression in Swiss mice, which seemed most likely to be mediated through an interaction with the adrenergic and dopaminergic systems. Background: Human immunodeficiency virus (HIV)-infected individuals on National AIDS Control Organization's (NACO)-India-Based-highly active antiretroviral therapy (HAART) regimen often continue experiencing neurological complications, referred to as HIV-associated neurocognitive disorders (HAND). Objectives: The prime objective is to assess the status of neurocognitive functions among HIV-infected individuals on HAART, using the International HIV Dementia Scale (IHDS). 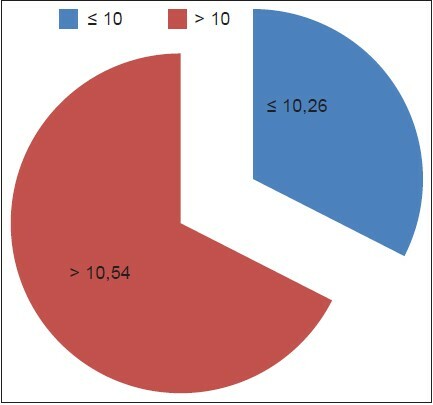 Materials and Methods: This prospective cohort study was carried out between October 2011 and September 2012, on 80 HIV-positive individuals, randomly selected from the ART Centre of PBM and AG Hospital, Bikaner, India. The patients were clinically examined and tested using IHDS. Results: All the subjects on HAART were found to have HAND-prevalence at 32.50%. Asymptomatic Neurocognitive Impairment (ANI) and HIV-associated Mild Neurocognitive Disorder (MND) were observed in 30 and 2.5% of the patients, respectively, and HIV-associated Dementia (HAD) was absent. Conclusion: In our study the IHDS Score was abnormal, that is, ≤10, in 32.50% of the patients, which shows probable neurocognitive impairment in the study subjects. This suggests the need to routinely screen HIV-positive patients, to recognize the neurocognitive deficits at an early stage and the IHDS may have great value as a screening test for HAND.